This is my second DT card for the 2 Crafty Critter Crazies September challenge and I've done it because my fellow DT, Teresa, had intended to use this image but had to take a leave this month so I'm filling in by using this gorgeous "Betta Fish Crowntail" image from our sponsor Fabrika Fantasy. For the coloring on this, I started with the pre-colored image then used my ProMarkers to add some more lavender and a gel pen to add more white for definition. The sentiment was printed at the same time as the image. I layered the image onto a blue card front, added one of my favorite bows for embellishment, and then left it as CAS as possible. 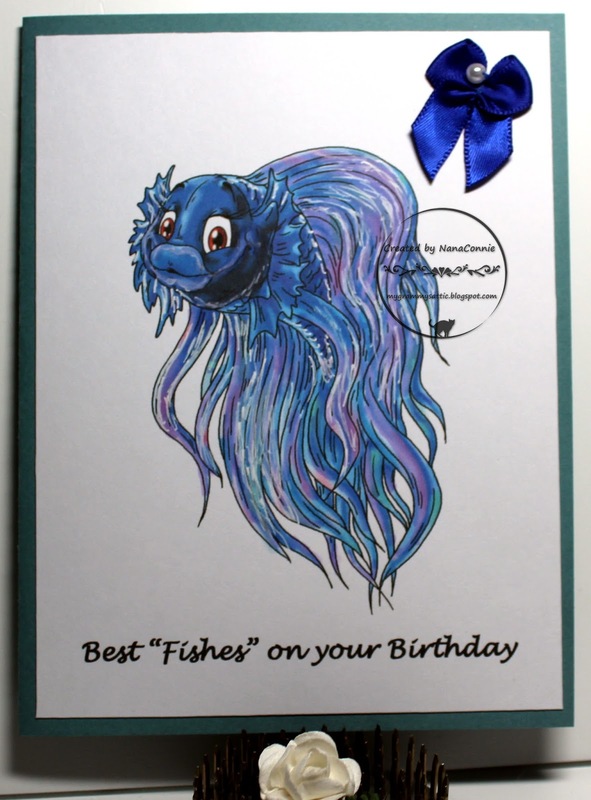 I really wanted the Betta to be showcased, and any embellishments I might have added would have taken away from that. Beautifully coloured! Love the image! Thanks for joining our challenge this week with Kraftin Kimmie Stamps. WOW Connie, this is amazing, what fabulous colouring, love the CAS with it, it really shows it off so well. Love the colours you chose here. Beautiful image and sweet sentiment, finished off perfectly with the pearly bow!